If you are an engineer you know what the college life means for engineers but if you have no idea what is college life for engineers then you should definitely read this article. The four-years an engineering student spent in college is like a roller coaster, so many things happen for the first time and so many experiences for the lifetime. After spending four years in an engineering college, giving more exams than any other course, having assignments every other day and yes hours spent in the lab, an engineer gets out of university with higher pay package than any other degree. It may seem that life of an engineering student is fun but the things an engineering student face can only be understood by engineering student only. The pressure engineering student goes through and hardship they do for four-years make them different from other graduates. They learn very important lessons for life in their college life. 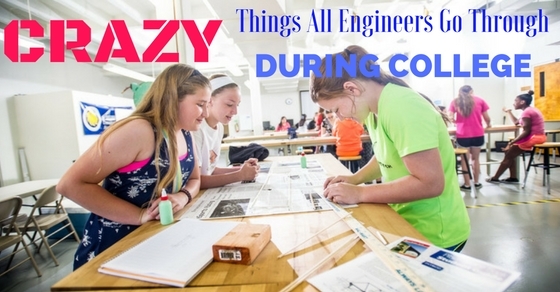 These are the things all engineers go through during college. What Every Student Go Through During College Days? After passing senior secondary high school with good scores, so many students prepare for engineering college every year and set wardrobes for attending college, but after spending one semester in college reality hits an engineering student that dress means a t-shirt and jeans, which is going to be used for next four years. If you are a senior engineering student then you understand what does dressing sense mean. Engineering students never have time to dress up smartly for attending college because of their busy schedule and constant exams throughout the year. They hardly get time to go shopping for the silly things like buying new clothes and if you are a girl then forget about dress shopping with your female girlfriends. After spending four years, engineering student understands the power of pockets. If you are wondering why so, simply because they have to carry a pencil and another geometrical tool for four years to use in labs and carrying a bag for small things like pencil and protector is a little too burden for engineering students. Pockets also help in keeping small notes about assignments safe for weeks. Pockets also play an important role in labs where engineering students seem to forget everything and take help from pocket hits to save the day and their life. Only an engineering student can understand the importance of lab and the practicals they did throughout the year. Engineering students on an average spend more hours in labs than their rooms where they try to figure out the mystery which remains a mystery for all four years but they complete every practice each semester without a hitch. Only God knows the secret of these practical’s but engineering students feel proud of their experiments and take pride in the work they do in the labs. The social life of engineers starts with the lab and at the end of the fourth year their social life end there as well. So many secrets and bro-codes shared in labs of an engineering college and all the trivial discussion of life takes place only here. Have you ever seen an engineering student a day before the exam? No? You will never see an engineering student out of their dorm rooms a day before exams. They are a pro in preparing for an exam in twenty-four hours before the exam, no matter the difficulty level of exam. After spending a semester in the hope of understanding what professor said and keeping up with labs practical with assignments on side, engineering students only get those last hours to prepare for the exam. Ask an engineering student if they mind preparing overnight for an exam and you will get to know how they become expert of preparing in last hours. This habit of working hard on last hour go with them to their offices as well and play an important role in their career because an engineer never knows when his workload going to sky-high with limited time to sort it out. Only engineers know how to work to meet deadlines when time is short and limited, you know why? Because in their whole four years of college life they have done the same, working to meet the deadline for submitting assignments, completing lab practicals within the time when they don’t even know the procedure beforehand and clearing exams in last 24 hours before the exam. They know just how to work under pressure and complete the task. Every engineer must have to face these challenges in his college life. Yes, this is the harsh reality of engineering student’s life. Semester breaks are the only holidays they get to enjoy or the summer holidays for first two years because in last two they set to prepare for getting the right job. ‘An engineer never sleeps’ these words describe college life of engineering students. In college, they have assignments, semesters and labs to do. An engineering student forgets about holidays after starting its college life because now his/her life revolves around labs, library, and assignments. The meaning of the holidays they seem to forget for four years of their life, even after college, this remains same for engineers. Deadly is the right word for the assignments they get all through their college life. These assignments never leave them in peace because internal marks also depend on the assignments done by the student. An engineering student has more assignment than days in a year from different professors for different tasks. Spend hours in the library to complete the assignment or to copy from others assignment but each and every student takes immense pride in their assignments. But engineering students never miss their single assignment because they know the power these assignments hold on their final marks. Lack of female population is another thing engineering student face in their college life which means no hope of getting a girlfriend. Yes, that’s true the girl’s presence in engineering class is just like the intelligent student in a history class, only a few. Girls too face the problem of lack of girls in engineering college and they too learn bro-code and life in labs and assignments. The students who got the chance of having girlfriend face the time crisis because they are always busy to go on dates, romantic dinners and fraternity party and girls know to avoid engineering students as a boyfriend. It may look funny but most engineering students face this dilemma but that’s okay with them because they were too busy in sorting out assignments and labs to worry about the girlfriend. You must have seen the trending jokes about engineering viva but there is some truth behind these jokes. Most viva of engineering courses is too difficult and most students spend all their energy in clearing out exams that they hardly have anything to say in viva or energy to stand the examiner. After spending sleepless nights for exams, students hardly get the stamina to keep anything in their mind but that’s okay because even after these critical situations they clear their Viva without any problem and these are the things that make engineering student pro in dealing with such situations. Engineering students never have the luxury of eating the handmade food of dorm’s mess where cooks prepare meals to satisfy their hunger. Instant noodles and granola bars are their best friend because they save them from starvation and keep them going especially in exams or week before semester exams. Engineering students understand the power of time that’s why they can live on instant noodles and granola bars as long as humanly possible. Engineering students get only a little time to enjoy and they use movies and music on a laptop as a way of entertainment. Engineering students hardly have time to go to a fraternity party, disc and club with their friends to entertain or to enjoy and celebrate. To keep themselves busy and stress-free they choose laptops over movie theaters and music videos over live concerts. After spending the first semester they understand that their laptops are their true friend and source of entertainment, also they are reliable because of all time availability. Every student has gone through this experience where their laptops are their best bait for entertainment. The relief of semester break is something only engineering students can understand. After giving assignments over assignments, exams and endless hours in the lab, semester breaks are the relief they wait for months. This is something an engineering student goes through because of the high workload degree but they love their breaks. They understand the importance of vacations because they hardly get throughout college year. The friendship formed in engineering college is for life. Spending four years together in high workload degree engineering taught you how to make best friends. Friends are very important for engineering students because friendship is their only hope in between assignment, internals, exams and labs. They understand each other like no one else because they were together in all of this and after college life is also not a piece of bread which makes them cherish their college friend and keep them for life. Friendship is the only relationship they got to enjoy in college life apart from a load of work and exams which happen after every six months for four years. Engineers cherish this beautiful relation of friendship they got in their college life. Engineers are loyal for their friend but they hardly make a friend out of their circle. The final big day they wait for four-year, is the graduation day which holds a special place for engineering students. All students in all programs wait for the graduation day where they get certified for what they learn in their college life but it holds a special place for engineers. Graduation day of engineering students is something only they experience after the hardship of four years. Graduation day is the day when they become actual engineers and going to implement what they learn in their college in companies and organizations. Engineers are considered as different from other graduates because of the structure of engineering program and their schedule in college life as well as the workload they bear for four long years. Their college years are full of assignments, exams and lab hours where they hardly got time to enjoy anything for four-year but they learn to cherish this change in their life. An engineer knows how to live life and how to make most out of it. Engineering is a respectable field because of workload and engineers who adjust according to the demands of work. After spending one semester in college they become use to all the different things that happen just for them like assignments every week. They learn to adjust and accept the changes very well. You will never see an engineer who regrets his degree or profession. They know how to get most out of it and celebrate every chance they get. These are the things only engineer’s experiences in their college years. It is said that engineers are night owl because how they pull off their exams in one night studies and their habits of late night work in colleges.